A new wave of terror threatens a world torn by inequality, conflict, economic disaster and environmental chaos. Heads of state gather in Dubai in an attempt to bring society back from the brink of global catastrophe. But when extremists hijack the conference centre, the clock starts ticking: seven days until certain death for presidents and prime ministers alike, unless the terrorists′ radical demands are met. hurtling towards the deadline and a shattering climax. Rotten Gods is both an imaginative tour de force and a dire warning, holding the reader spellbound until the last breathtaking page. It took seven days to create the world … now they have seven days to save it. Extremists hijack the conference centre where heads of state have gathered in an attempt to bring society back from the brink of global environmental catastrophe, and the clock starts ticking: seven days until certain death for presidents and prime ministers alike, unless the terrorists′ radical demands are met. airline pilot searching for his missing daughters, and Madoowbe, a mysterious Somali agent, are all forced to examine their motives, faith and beliefs as they attempt to stave off disaster, hurtling towards the deadline and a shattering climax. 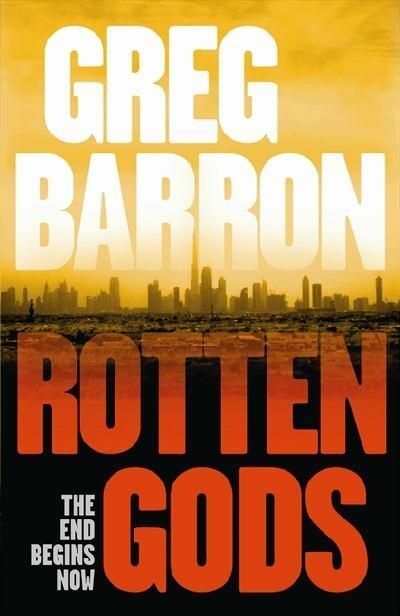 ROTTEN GODS is not a quick read, but don’t let that put you off – it is well worth your attention and signals the arrival another Australian author to put on your “look for” list. There is nothing about this book to indicate it is a debut title. The plotting is well executed and the writing is tight, with plenty of detail and plenty of depth. The fact that the action is on a 7 day deadline heightens the tension. There are four main plot arenas and the story moves easily from one to the other. What doesn’t sit so easily for the Western reader is the account of the damage their lifestyle has done, and continues to do, to the global environment. So this becomes a book with a message as well. It also highlights the attractiveness of extremist action for those who feel that the world, or at least those responsible for environmental policy, is not listening. I was reminded of the plot of THE LORDS’ DAY by Michael Dobbs in which the Queen is taken hostage by terrorists at the opening of Parliament in the House of Lords. ROTTEN GODS however is far more global in its theme. canoed down a flooded tropical river, and crossed Arnhem Land on foot. coastal hinterland with his wife and two sons. A second title, SAVAGE TIDE, is already available. In the near future world leaders gather in Dubai to discuss the multiple crises facing the planet: environmental degradation, climate change and economic collapse. But the man designated to give the opening address, a doctor and humanitarian worker, instead threatens the audience with explosives and, along with other armed terrorists, locks down the the conference hall which turns the leaders and their respective entourages into high profile hostages. Over the next seven days the terrorists host mock trials and executions of leaders inside the hall while waiting to see if their grand demands will be met and outside people scramble for solutions. ROTTEN GODS is a big book in both word count and scope and it could have done with being a shade smaller on both counts. It’s clear from both the story itself and the author interview incorporated at the end of the edition I read that Barron wanted to write more than a bog standard action thriller. And he has. The book does explore ideas and it does so from multiple perspectives. For example while never portraying terrorism in a positive light or condoning the practice in any way the book does do a good job of showing how some terrorists are formed out of sheer desperation and frustration at the injustices of their worlds. For me the exploration of the planet’s environmental and consumerism problems was less successful, though equally well intentioned. Some of the passages relating to these issues did cross the line into lecturing the reader and that always raises my hackles both because I read enough non-fiction about these subjects and because it takes me out of the story. That issue aside the book offered a jolly good yarn, with loads of heart-stopping action in exotic locations and a smattering of non-standard thriller characters. Simon is an English man whose diplomat wife has inadvertently allowed herself to be seduced by one of the terrorists which has resulted in her being held hostage with the other leaders and her two daughters being kidnapped. His ensuing hunt to find the girls shows just what lengths a mild-mannered airline pilot might go to when pushed too far. Marika Hartmann is an Australian intelligence officer assigned to work with the Dubai security forces for the duration of the conference and, feeling guilty because she sensed something was amiss before the terrorists took over but did not act, she volunteers to parachute into Somalia in an effort to locate the wife of the man who led the terrorists into the Dubai conference hall. She’s a no nonsense woman who injects a bit of humour into what is otherwise a fairly grim story and is a very enjoyable character. I can forgive début novelists for including too much in their first novel (all those ideas building up for years) and there are more than enough other elements here to show Barron’s promise as a writer of intelligent thrillers that entertain as well as make us think. In what seems to be my standard complaint I think ROTTEN GODS would have been better if it were a hundred pages shorter but books-as-doorstops do seem to be somewhat de rigueur these days. Overall though it is a solidly entertaining read, gathering pace as it goes and posing several plausible, if uncomfortable, ‘what if’ scenarios for our collective near future.